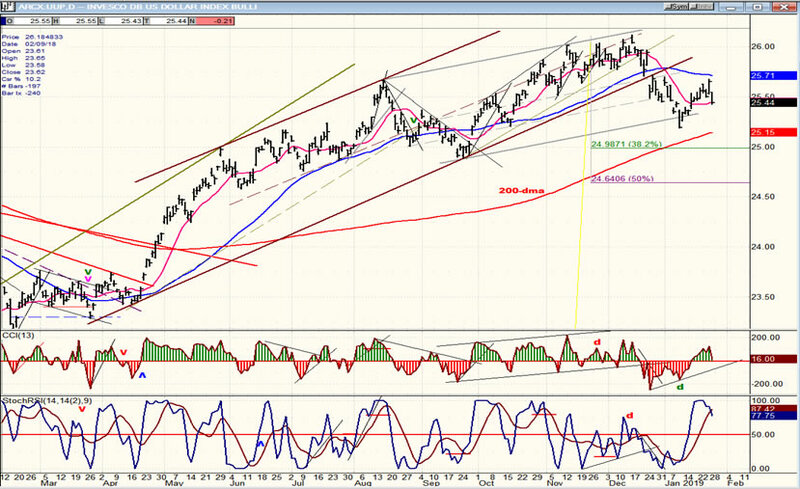 SPX: Long-term trend – Correcting within the very long-term bull market trend. 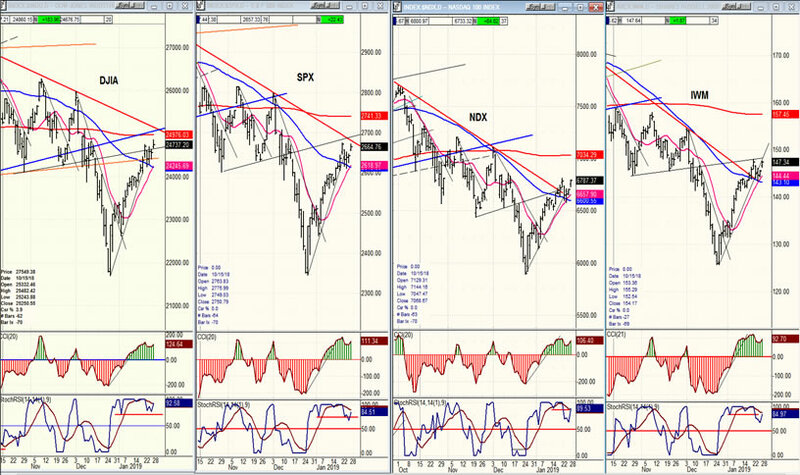 It only takes a quick glance at the daily SPX indicators to assess the current market position. Last week, for the first time since the 2346 low, they “sputtered”. It is no wonder since from about 2600 the index has started to meet with more and more overhead resistance which extends all the way to 2800-2815. If you want to know when we can be fairly certain that the bear market has ended, it will be when these levels are exceeded, and it’s obviously not going to be anytime soon! But over the short term, the daily indicators are still in the green! SPX closed at 2665 on Friday. This is where the ‘going up’ gets tougher because the nearby overhead band begins to derive assistance from the June/July lows of last year. On Monday, the index reached 2675 and was pushed back down to 2612. 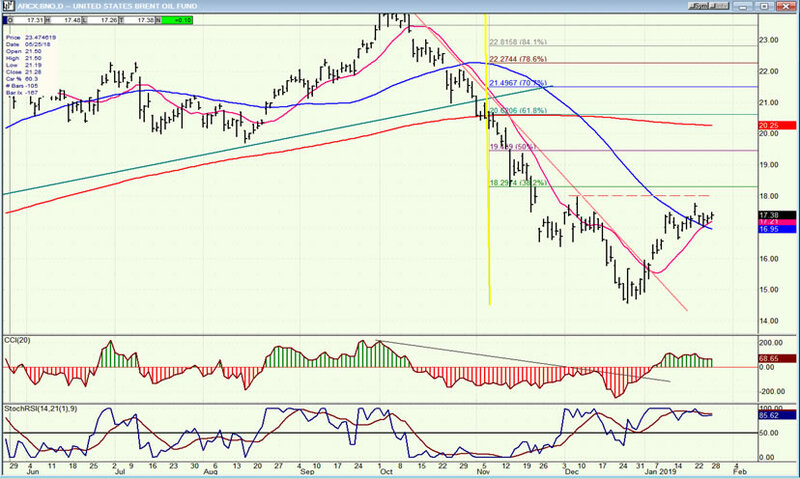 Friday’s move can therefore be considered a test of the recent high which has not yet given signs of being attained and actually has the possibility of reaching 2675-2680 and perhaps 2713. The former is a near-term P&F projection and the latter would constitute a .618 Fib retracement of the entire decline from 2941 to 2346. It’s a fairly safe bet that, when you combine these projections with the overhead resistance denoted earlier, we should look for a correction to start by the end of the month. The weekly indicators have also improved, but remain in the red. I have widened the chart so you can see more clearly the support and resistance levels discussed above. You will have to scroll down in order to see the indicators. Let’s start there! Last week they all turned down with the A/Ds (bottom) leading, which is normal. By the end of the week, they were turning back up. In order to get a sell signal, they need to keep going down and drop below the zero line (or the 50% line). This is usually preceded by divergence and we are now in a position to develop some if we make a slightly higher high in price, and the indicators remain below their former peaks. The rally took prices past the lower band of resistance which has now become support. At the same time, it moved above the 50-dma which is a sign of moderate strength, but that indicator is still moving down, and it would require more rally and more time to turn it up. Also, the 50-dma crossed below the 200-dma in December, and this was followed by the biggest selling wave of the decline, probably because many traders believe that when this happens, it is a sign that we have entered bear market territory. The 50 remains well below the 200, and it will take considerable time for it to get back above it. Until this happens, we cannot contemplate the bear market being over, and the risk of, at a minimum, retesting the low still dominates. Consequently, our correct orientation should be on the short term with an expectation that this rally from the late December low is nearly over with, at best, a further move to the top of the resistance band which would correspond with a .618 retracement of the entire decline. I am fairly certain that by next weekend the signs of the rally top will be more obvious. 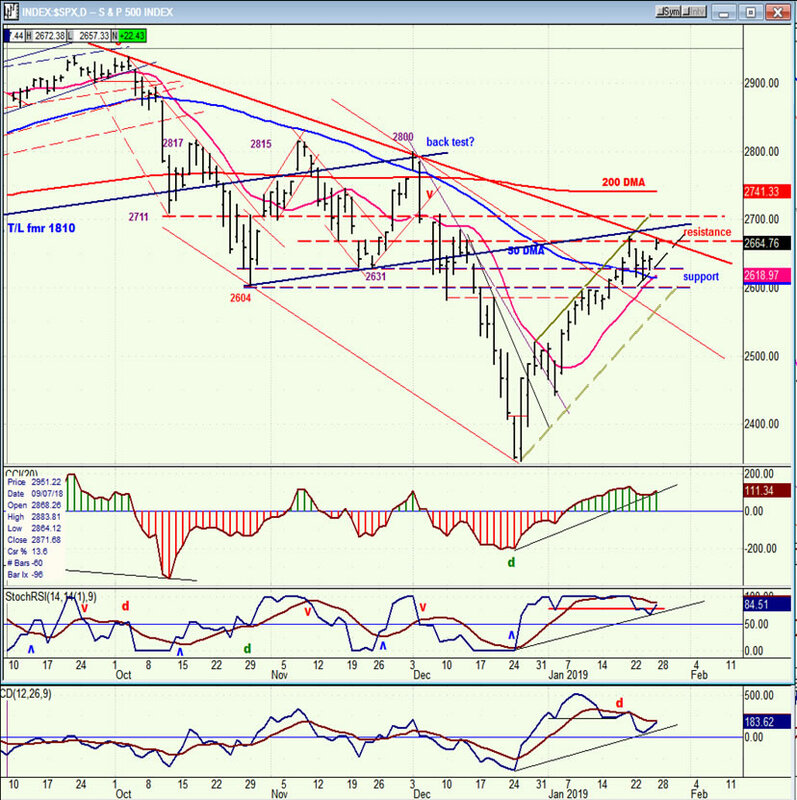 Until last week, the index had formed a wedge pattern. 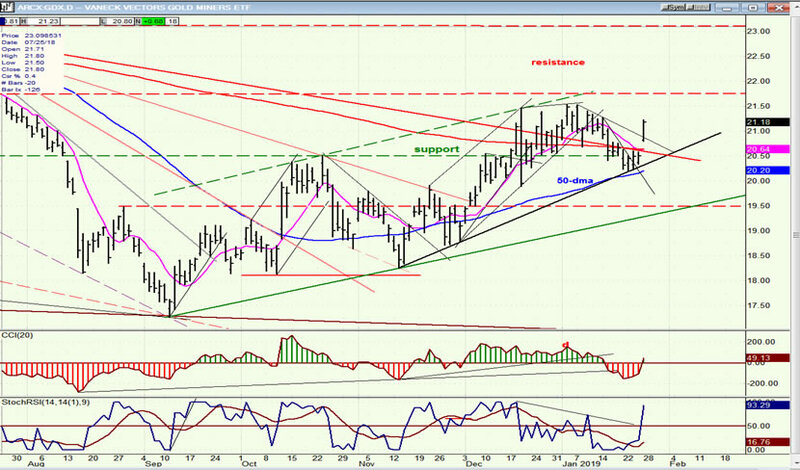 The trend line was broken on Tuesday, but the correction was shallow and, after a couple of days of consolidation, Friday saw a gap opening which neared the previous high but seemed reluctant to overcome it. Any amount of weakness at Monday’s opening would probably create a sell signal at the hourly time frame, but the fact that we have potentially higher projections creates an upside bias. Also, on Wednesday the FOMC statement may show that the Fed is less sanguine about interest rates than it has been and trade talks resume; on Friday we’ll have the jobs report and the government is now re-opened -- if only for three weeks with certainty. Overall, the news background next week may favor the bulls. 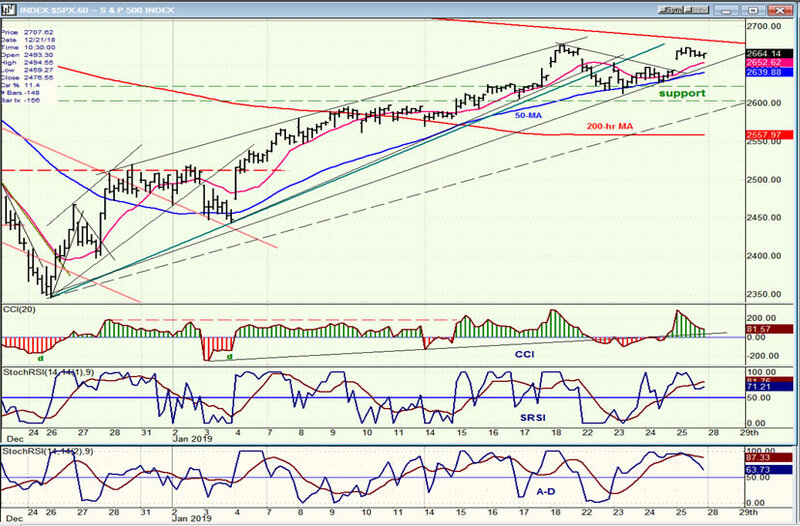 Also, if we can get above the red trend line which connects 2941 to 2800, it would encourage a little more buying. The fact that there are higher projections and that cycles are predicting a high at some time next week suggests that there is a little more to go before we reverse the trend which started from 2346 and which now measures 329 points. The DJIA is the only index of the four shown below which has already surpassed last Friday’s high. It is also the only one which is near back-kissing its broken blue trend line from 2016. The other three’s performance is roughtly the same over the short-term, but IWM remains a laggard when we compare it on a longer-term basis, since it remains the farthest below its 200-dma. We also see that there is no near-term relative weakness developing between it and the SPX and NDX, and that also points to the rally possibly having a little farther to go. UUP’s little bounce from its lower minor channel line is probably part of the larger correction pattern that started when it broke its uptrend line. If so, the next move should take it down to at least to 24.65 and perhaps lower to 23.00 before the correction comes to an end. This could take several months to accomplish and I will stick with this potential scenario until I see the index deviating from it. GDX held support as well as its uptrend line and appears to have broken out into a new uptrend on Friday. If so, we should see some follow through to a new high over the near-term; but the move may be limited to about 22-22.50 for now and be followed by additional consolidation. The best long-term assessment for GDX is that it has started the c-wave of a wave 4 correction which stated on January 16. BNO found a low where it should have, and rebounded. It may be close to ending its recovery move before settling down for some additional base-building. SPX had a shallow correction at the beginning of last week, held support, and rebounded coming close to re-testing its near-term high on Friday. I have given my reasons for expecting mildly higher prices before ending what I still consider to be a countertrend rally and reversing. With a trial subscription, you will have access to the same information that is given to paid subscribers, but for a limited time period. I think you will find that knowing how far a move can carry is one of the most useful benefits of this service, whether you are a trader or an investor -- especially when this price target is confirmed by reliable indicators which give advance warning of a market top or bottom. Furthermore, cycle analysis adds the all- important time element to the above price projections. For a FREE 4-week trial, further subscription options, payment plans, and for general information, I encourage you to visit my website at www.marketurningpoints.com.